NASA astronaut Terry Virts took this photo of the January 2015 winter storm from the International Space Station. He posted the picture, which shows the storm churning near Boston, on Twitter on Jan. 28. The monster winter storm that dumped loads of snow on the northeastern United States on Monday and Tuesday (Jan. 26 and 27) looked pretty beastly from 250 miles (400 kilometers) above the planet. 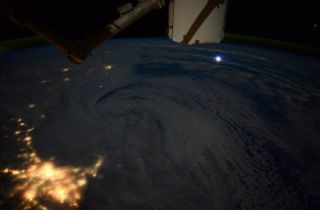 NASA astronaut Terry Virts, a member of the current Expedition 42 crew aboard the International Space Station, captured several dramatic photos of the storm Tuesday night, as it wheeled and churned over New England. The blizzard "looks like a hurricane — last night she was just east of #Boston," Virts tweeted about one image, which also features what looks to be a flash of lightning northeast of the storm. This photo, taken by NASA astronaut Terry Virts from the International Space Station, shows a winter storm battering the U.S. East Coast. Virts posted the picture on Jan. 28, 2015. Robotic eyes have also been keeping tabs on the winter storm, from much higher altitudes. For example, the Suomi National Polar-orbiting Partnership satellite, which is operated jointly by NASA and the National Oceanic and Atmospheric Administration (NOAA), looked on as the storm hammered the Northeast early Tuesday morning, when it was near peak intensity. "The nighttime lights of the region were blurred by the high cloud tops associated with the most intense parts of the storm," NASA officials wrote about the satellite image. Other images of the winter storm — which is known as a nor'easter, because its winds are blowing primarily from the northeast — have come courtesy of NOAA's GOES-East satellite. This image by the Suomi NPP satellite, which is operated by NASA and the National Oceanic and Atmospheric Administration, showed the January 2015 winter storm near peak intensity as it moved over the New York through Boston metropolitan areas at 1:45 a.m. EST on Jan. 27. GOES-East (short for Geostationary Operational Environmental Satellite) captures infrared and visible-light cloud data, which is then overlain on views of land and sea taken by NASA's Aqua and Terra Earth-observing satellites. The winter storm, which meteorologists have been calling Juno, dumped up to 3 feet (0.9 meters) of snow on some parts of New England over the past few days. It is now petering out, but the U.S. National Weather Service says the Northeast will likely get another round of snowfall Thursday and Friday (Jan. 29-30). European Space Agency astronaut Sam Cristoforetti posted this photo on Twitter on Jan. 28, 2015. "In these winter time sometimes it feels like the whole world is shrouded in clouds! #HelloEarth" she wrote. Indeed, parts of the planet look like a winter wonderland from orbit at the moment. "In these winter time[s], sometimes it feels like the whole world is shrouded in cloud! ‪#HelloEarth," Virts' Expedition 42 colleague, European Space Agency astronaut Sam Cristoforetti, posted on Twitter early Wednesday (Jan. 28), along with a stunning photo of the planet.